My favorite videos are the ones where no one gets hurt. Sure, you might see something crazy. You might tear out your extremely beautiful hair and scream until your vocal cords shatter into a thousand separate molecules, but as long as no one dies or gets hurt, I am completely fine. I mean, take this video for example. 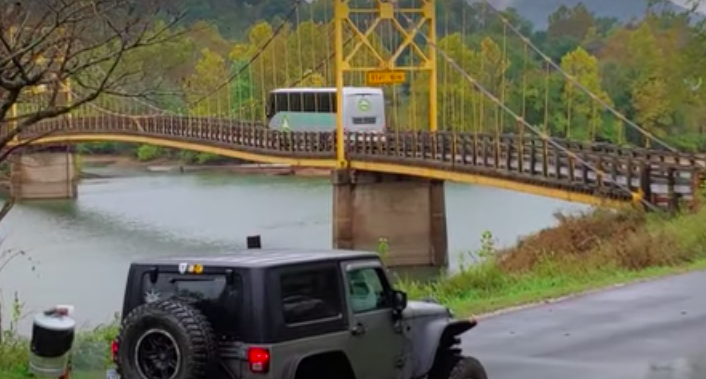 What are you watching is a thirty five ton bus boldly crossing a ten ton bridge — the Beaver Bridge in Arkansas — not build for a bus of this magnitude– as the bridge sags beneath the bus’s considerable weight. If you want to see an insane video of a bus’s pure and unadulterated hubris, I guess check out the video so you can go insane or whatnot. Ahhh! Ahh, I declare, ahhh! Look, sometimes you just have to take the long way, because I can promise you, digging that bus out of the water would have been a lot more work than that. Thank goodness no one got hurt. But also: ahhh! Cooooool. We can now add being in a bus to the growing list of things we are afraid of including being on a plane, being on a train, being inside our own homes, being outside our own homes, and the image of the “Viral Hog” mascot that posted this clip coming to devour us in the night with its terrifying swine snout. What do you think of this insane video? Let us know in the comments or on Twitter at @WhatsTrending.